Chef Michel Richard’s Villard Michel Richard is located in The New York Palace hotel, the same property that once housed Le Cirque and Gilt. The restaurant offers breakfast, lunch and dinner daily. Villard Michel Richard, The New York Palace, 455 Madison Ave., New York, NY 10022, 212-891-8100. After having to close its original Brooklyn location, acclaimed pizzeria Motorino is back in Williamsburg. The restaurant, which also has an outpost in the East Village, will feature the same great pies plus a few new menu items. Motorino Brooklyn, 139 Broadway, Brooklyn, NY 11211, 718-599-8899. Chef Michael White's The Butterfly is a slight deviation from his usual full-on Italian restaurants. This TriBeCa venue is a supperclub with cocktails created by Eben Freeman. The menu is filled with hearty American-style fare. The Butterfly, 225 W. Broadway, New York, NY 10013, 646-692-4943. Dinosaur Bar-B-Que has just opened an outpost in Brooklyn. The restaurant, originally from Syracuse and with an eatery in Harlem, is very popular for its meaty delights and the Brooklyn version should be no exception. Dinosaur Bar-B-Que Brooklyn, 604 Union St., Brooklyn, NY 11215, 347-429-7030. In the spot that previously housed The Sunburnt Calf in Brooklyn's Prospect Heights comes Hawker Bar, a Southeast Asian-themed bar and restaurant. The menu reflects the cuisines of Singapore, Vietnam, Thailand, Malaysia and Indonesia. Hawker Bar, 611 Vanderbilt Ave., Brooklyn, NY 11238, 347-915-1000. Distilled, a new American restaurant in TriBeCa, is the product of chef Shane Lyons, who has logged time at Momofuku Noodle Bar, and restaurateur Nick Iovacchini. Seared scallops and ducks, as well as salads and soup are a few of the menu items. Distilled, 211 W. Broadway, New York, NY 10013, 212-601-9514. The second location of the Staten Island-based pizzeria Goodfella's Brick Oven Pizza has opened in Gramercy Park. The restaurant serves up Italian classics and pizza with a large selection of wines by the bottle and glass. Goodfella's Brick Oven Pizza, 391 Second Ave., New York, NY 10010, 212-545-8500. The guys behind Torrisi Italian Specialties and Carbone have abandoned their plan to open a lobster place on Thompson Street. Instead, they are launching in the same space ZZ's Clam Bar, named for their partner Jeff Zalaznick. The restaurant will offer fish and a raw bar, as well as creative cocktails. ZZ's Clam Bar, 169 Thompson St., New York, NY 10012, 212-254-3000. The flagship location of Nathan's Famous at Coney Island has re-opened. The iconic hot dog stand had been closed due to damage from Hurricane Sandy. 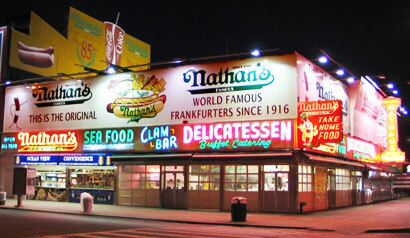 Nathan's Famous, 1310 Surf Ave., Brooklyn, NY 11224, 718-946-2202. The 40-seat Old School Brooklyn restaurant is a culinary time machine, churning out Italian-American delights like spaghetti and meatballs and turkey meatloaf. Old School Brooklyn, 520 Court St., Brooklyn, NY 11231, 718-407-0047. Hecho en Dumbo, the popular Mexican spot on the Bowery, is now offering a $35 weekend brunch special: from 11:30 a.m.-4 p.m. during summer weekends, diners get one entrée and one-hour of bottomless margaritas or micheladas. Hecho en Dumbo, 345 Bowery, New York, NY 10003, 212-937-4245. BrisketTown, the popular barbecue spot in Williamsburg, now has a liquor license, which means you can wash down all that tender, smoky meat with a tall, cold beer. Cheers! BrisketTown, 359 Bedford St., Brooklyn, NY 11211, 718-701-8909. Chef Danny Bowien, owner of hit restaurant Mission Chinese Food, is rumored to be opening a new place on the Lower East Side. Word on the street is that it will feature Mexican food and be located in a space on the corner of Orchard and Stanton. Mission Chinese Food, 154 Orchard St., New York, NY 10002, 212-529-8800. Fatty 'Cue has begun a five-course tasting menu of the restaurant's old and new dishes. The menu will only be available Sunday to Wednesday and costs $49. Fatty 'Cue, 50 Carmine St., New York, NY 10014, 212-929-5050. The city has finally okayed the restaurant that will be in the pavilion on the northern part of Union Square. The farmers market-driven eatery is being led by 5 Napkin Burger owner Simon Oren. Few details are available at the moment, but the restaurant is expected to open later this year. Acclaimed sushi spot Sushi Yasuda has asked its customers to stop tipping. Following the custom in Japan, the servers are compensated by the restaurant in their salary for gratuity. Sushi Yasuda, 204 E. 43rd St., New York, NY 10017, 212-972-1001. The recently closed Flatiron District restaurant Ciano will reopen in August, but with a few changes. For starters, it will be located on the Upper East Side. Secondly, its chef, Shea Gallante, will no longer be involved. The new chef is Tien Huyn. There's a new chef firing up the burners at Sea Grill: Yuhi Fujinaga, a protégé of former Sea Grill chef Ed Brown. The Sea Grill, Rockefeller Center, 19 W. 49th St., New York, NY 10020, 212-332-7610. Locanda Verde's pastry chef Karen Demasco is leaving the restaurant. Her replacement is Nancy Tran. Locanda Verde, The Greenwich Hotel, 377 Greenwich St., New York, NY 10013, 212-925-3797. The popular Brooklyn restaurant Dressler has shut down for good. Dressler, 149 Broadway, Brooklyn, NY 11211, no phone. One-and-a-half-year-old The Sunburnt Calf in Prospect Heights has shut down. A new restaurant, Hawker Bar, has taken its place. The Sunburnt Calf, 611 Vanderbilt Ave., Brooklyn, NY 11238, 347-915-1000. The Lower East Side restaurant Alias will serve its last dinner Friday, June 14. Alias, 76 Clinton St., New York, NY 10002, 212-505-5011. Chef Michael 'Bao' Huynh's erstwhile New York restaurant empire continues to crumble. An outpost of Baoguette, this one on Nassau Street downtown, has closed. The chef has since moved to Vietnam where he can be seen on Iron Chef Vietnam. Baoguette, 75 Nassau St., New York, NY 10038, no phone. New York's dining-in-the-dark restaurant, Dans Le Noir, has shut down because of lack of interest in the dining concept. Dans Le Noir, 246 W. 38th St., New York, NY 10018, no phone.